“The Company You Keep,” which opens in Chicago on April 12, 2013 and is rated “R,” also stars Shia LaBeouf, Stanley Tucci, Susan Sarandon, Nick Nolte, Chris Cooper, Anna Kendrick, Richard Jenkins, Terrence Howard, Brendan Gleeson, Sam Elliott, Julie Christie, Jackie Evancho and Brit Marling from director Robert Redford and writer Lem Dobbs based on the novel by Neil Gordon. To win your free “The Company You Keep” passes courtesy of HollywoodChicago.com, just get interactive with our unique Hookup technology below. That’s it! This screening is on Monday, April 1, 2013 at 7 p.m. in Chicago. The more social actions you complete, the more points you score and the higher yours odds of winning! You must be 17+ to win this “R”-rated Hookup. Jim Grant (Robert Redford) is a public interest lawyer and single father raising his daughter in the tranquil suburbs of Albany, New York. Grant’s world is turned upside down when a brash young reporter named Ben Shepard (Shia LaBeouf) exposes his true identity as a former 1970s anti-war radical fugitive wanted for murder. After living for more than 30 years underground, Grant must now go on the run. With the FBI in hot pursuit, he sets off on a cross-country journey to track down the one person who can clear his name. Shepard knows the significance of the national news story he has exposed. For a journalist, this is an opportunity of a lifetime. Hell bent on making a name for himself, he is willing to stop at nothing to capitalize on it. He digs deep into Grant’s past. Despite warnings from his editor and threats from the FBI, Shepard relentlessly tracks Grant across the country. As Grant reopens old wounds and reconnects with former members of his anti-war group (the Weather Underground), Shepard realizes something about this man is just not adding up. With the FBI closing in, Shepard uncovers the shocking secrets Grant has been keeping for the past three decades. As Grant and Shepard come face to face in the wilderness of the Upper Peninsula of Michigan, they each must come to terms with who they really are. 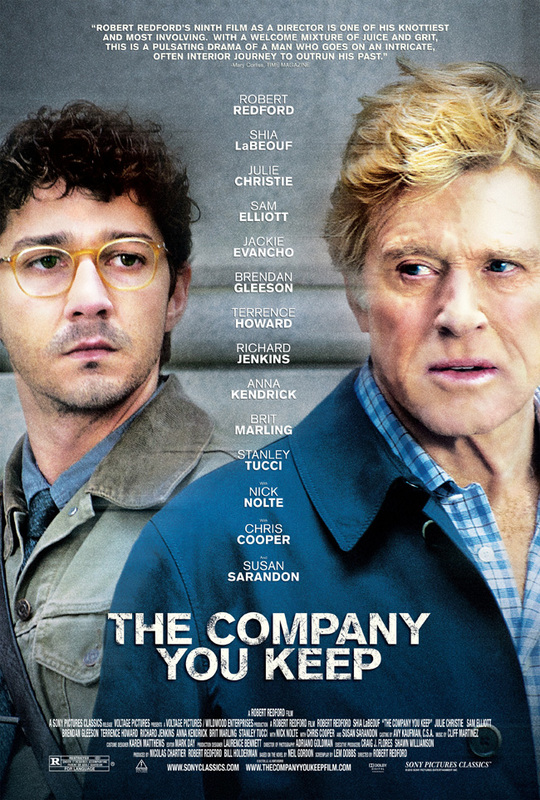 The movie poster for “The Company You Keep” starring Robert Redford and Shia LaBeouf. The movie trailer for “The Company You Keep” can be watched now below. This HollywoodChicago.com Hookup is simple! Just get interactive in our unique Hookup technology above. We will award 30 admit-two movie tickets based on social entry numbers and/or randomly via e-mail for our “The Company You Keep” Hookup. Good luck!